‘Fine wine is made in the vineyard’. This is central to the work at the Domaine at all times of year, from pruning to harvest. 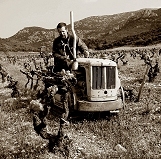 Each vine is pruned appropriately for its soil, age and vigour. Treatments throughout the year use the product the least toxic for the plant and animal life found in and around the parcel, and include no herbicide, no systemic pesticides and no chemical fertilisers. Shoot selection and limited green harvesting optimise the vigour and productivity of the vine. Since 2008, all our vineyards have been officially registered as being organic, as controlled by Ecocert. This commitment is not a market-led, politically-correct statement, rather it is a formalisation of the way we have always worked and of our farming philosophy. 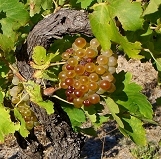 During this time, we have seen an improvement both in the health of the vines and in the balance of the wines. As our aim is to express the terroirs of the domaine, we see the cornerstone as being the health of its vineyard ecosystems. 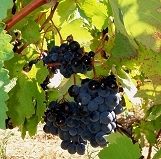 The finest and best adapted red grape varieties traditionally grown here are the Carignan Noir and the Grenache Noir. Many of the gnarled vines are over 100 years old and from these the true taste of the region can be found; intense, vivid cassis fruit and wild thyme, fennel, rosemary and juniper aromas.